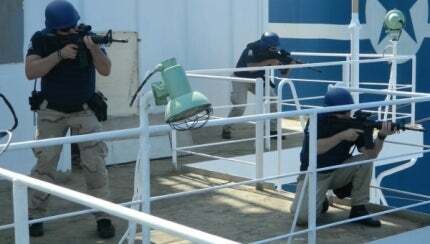 Aspida is an experienced private maritime security company (PMSC). As the threat of piracy grows increasingly dangerous, PMSCs are increasingly relied upon. We offer a comprehensive range of services and products, tailored to the marine and offshore sectors, including our Easi-Chock© door securing device. Aspida’s first-hand knowledge of the maritime security industry makes us a reliable provider of solutions in even the most challenging conditions. Aspida meets all IMO guidelines for the use of armed security guards onboard merchant vessels, and is currently undergoing ISO 28007 certification. As a founding member of the International Code of Conduct Association for Private Security Companies, we understand the importance of safety and discipline in potentially dangerous situations. Aspida was also one of the first companies to be accepted into the Security Association for the Maritime Industry (SAMI), and is now a certified stage one member. In September 2013, there were 21 reported pirate incidents in the high risk area (HRA) off Somalia, which were all reports of suspicious approaches or activity. This is an increase in activity compared with August 2013 and September 2012, when there were 13 and six reported incidents respectively. There is insufficient evidence to establish whether every report of suspicious approach or activity was an actual pirate incident. However, the high level of activity highlights the importance of security and vigilance. Our experienced security teams work closely with crews onboard any vessel, as well as locally sourced armed personnel. This relationship and communication is crucial, in order to provide peace of mind for the shipping company and, more importantly, the crew. The mixed nationalities of our security personnel make it likely that a common language will be found. Our highly skilled personnel are carefully recruited, trained and approved with a range of certifications and checks before deployment, including CRB, STCW, MFCC, army discharge papers, psychometric evaluation, cardio, seafarers medical and psychiatric clearance. Thorough drug and alcohol testing is carried out in close association with Alere Toxicology, a world-leading provider of laboratory tests, which are completed to the highest standards across all industries. Aspida security teams do not just protect the crew; they also train them. Seafarers learn how to deal with emergency situations, suspicious activity and attacks, while specialists design customised courses for personnel both onshore and offshore. To maximise vessel security, we provide consultancy services at the design stage for new-builds and on retrofit solutions for existing vessels. The maritime security market evolves at a rapid pace, with legislation and requirements regulating PMSCs becoming stricter. For this reason, Aspida has implemented a very rigorous and precise HRM system with an aim to raise the standards of the contractors it employs and diminish the possibility of misconduct or accidents. Contemporary piracy emerged in the 1980s with globalisation and accelerated in the 1990s with the Asian financial crisis (Samatar, Lindberg & Mahayni 2010). Although fatigue is a well-examined topic in scientific literature, in the maritime industry it seems to be rather neglected.